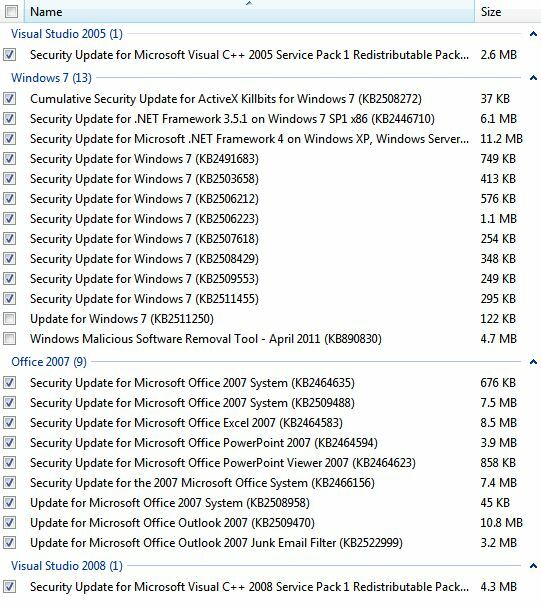 Patch Tuesday: April 2011 Is a Doozy! A personal record for Patch Tuesday: Up to 24 files to download and install! Notice that only two items are unchecked by default: KB2511250 relates to an issue printing SVG graphics or CSS3 style sheets in IE9, and the Malicious Software Removal Tool is a usual Patch Tuesday feature. The former is something many users are not likely to need, while Microsoft is being smart about leaving the latter unchecked because it takes some time to run to completion and has occasionally caused problems when batched in with Patch Tuesday stuff in the past. Vulnerability in .NET Framework Could Allow Remote Code Execution (2484015) to bypass Code Access Security (CAS) restrictions. Note: RCE is my abbreviation for Remote Code Execution, by far the most likely type of vulnerability you’ll encounter in this month’s batch of updates. Lots of important IE vulnerabilities are addressed here, including some recently reported zero-day and the latest PWN2OWN exploits as well. Roll up your sleeves, admins: you’ve got some work to do!